The management of spare parts is very important because of functional and economic reasons. In order to have a good level of availability of spare parts, it is necessary to have a stock level of spare parts. On the other hand, the efficacy and efficiency of maintenance policies depend on the ability to optimize the management of such supplies. Moreover, effective stock life cycle represents for a company an elevated voice of profit. The aim of Proactive Spare Parts Management System is to determine the optimal spare parts volume so to minimize the operating costs and of the lost sales costs for unavailability. The system provides different parallel classification criteria of spare parts by means of opportune Criticality Analysis. According to an appropriate setup, spare parts are divided in a series of classes corresponding to different management policies. 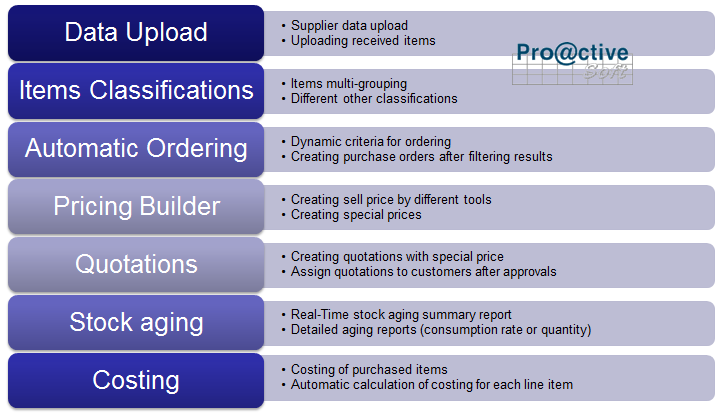 Using the system automatic ordering function, your organization will have a solid system that prevent a huge percentages of dead stock, increases your service level percentage and allows your invetements to grow by shortining the life cycles, therefore increases the number of cycles within your fiscal year. Multi-entity capabilities: Up to 9 levels of search and inquiry: Type , Group, category, sub-category, brand, business unit, etc..